Hyperblimp high over the foothills of Columbia. 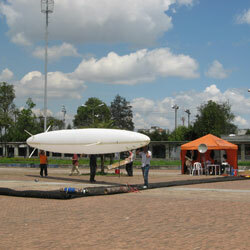 Hyperblimp demo in Bogota for TV Prensa. Pink tethered balloon used to check turbulence. 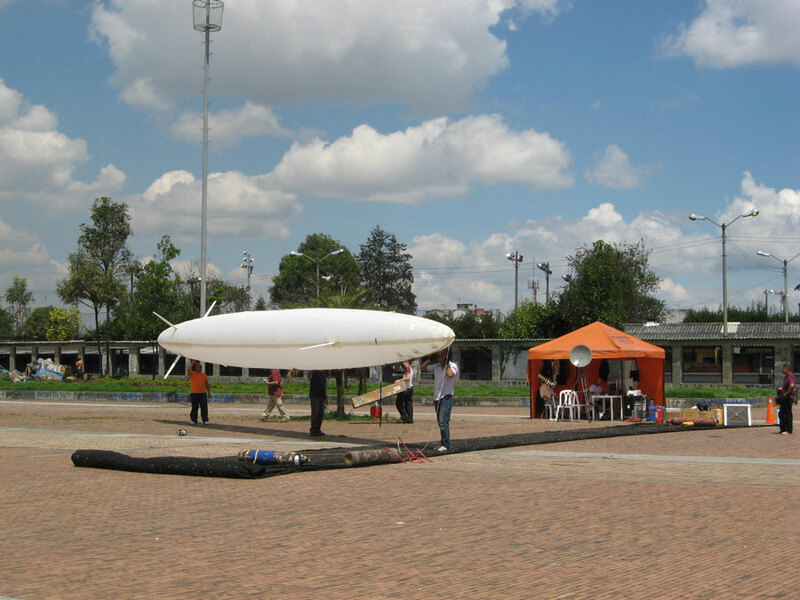 TV Prensa and Hyperblimp crew. 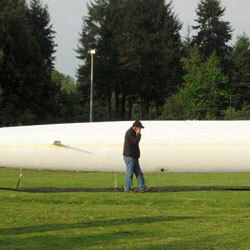 Many hands made light work on this 50’er. Spencer Deputy (6’4” for reference!) flying 50’er with high def gimbaled camera. 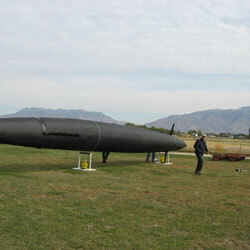 Prototype for Ogden Police for night flying in high crime area. Working with Flying Sensor colleagues to film local golf course. 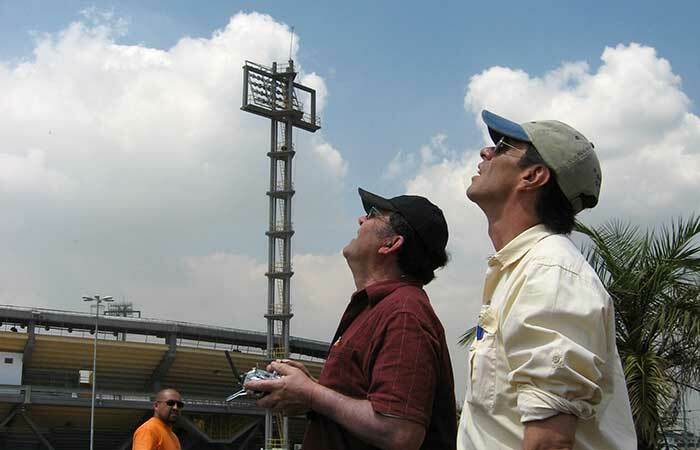 Ground crew checking various antennas. Perspective from small body with curious mind. 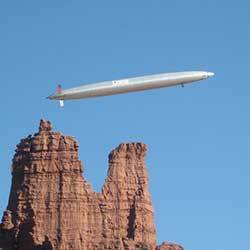 Hyperblimp LLC aims to promote the growth of the airship industry, particularly for humanitarian, environmental, and educational purposes. 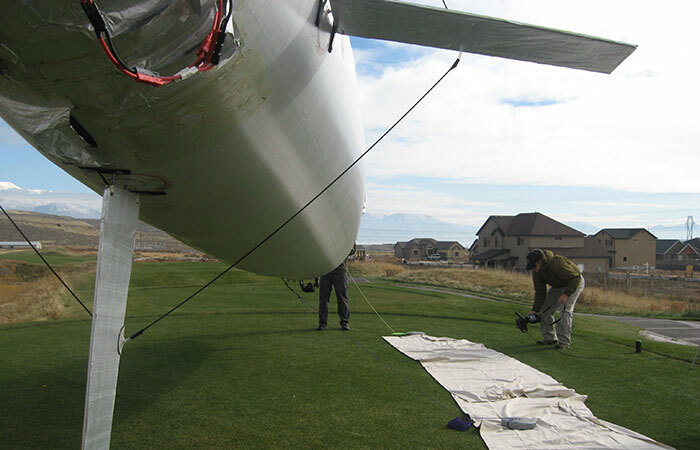 Hyperblimp is actively working with “green technologies,” particularly solar electric panels and eventually fuel cells, along with extreme efficiency and advanced nanotech materials. 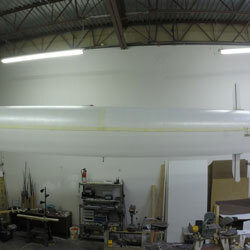 Hyperblimp intends to establish a quality UAV platform for aerial photography, intelligent surveillance, scientific and wildlife research, search and rescue, first response situations, locating un-detonated ordinances, sweeping mine fields, and assisting with global warming studies, to cite some examples. 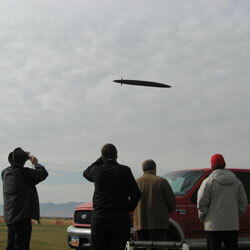 We intend to serve as a platform for high speed communications, particularly in remote areas. We are presently working on a 24/7 high speed solar airship that we intend eventually to fly around the world via remote control. 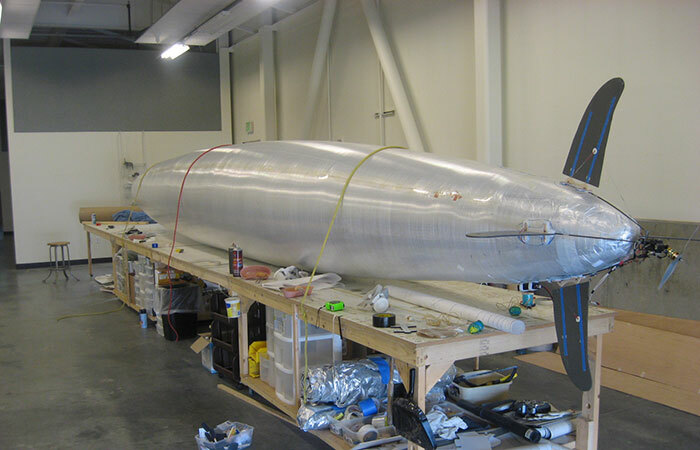 We are aiming for 100% helium retention and closely following developments in electronics and graphene usage. 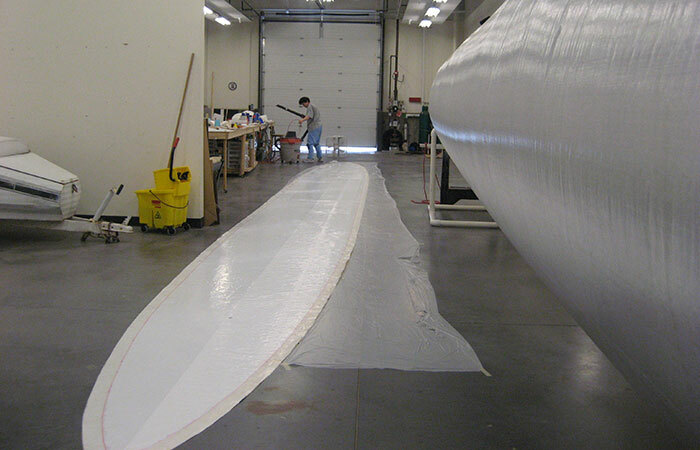 Hyperblimp has and will continue to partner with other companies to expand airship application and use; improve production facilities, stay focused on low-cost and (to the extent possible) recyclable materials; and pursue research and development in critical end-use areas. 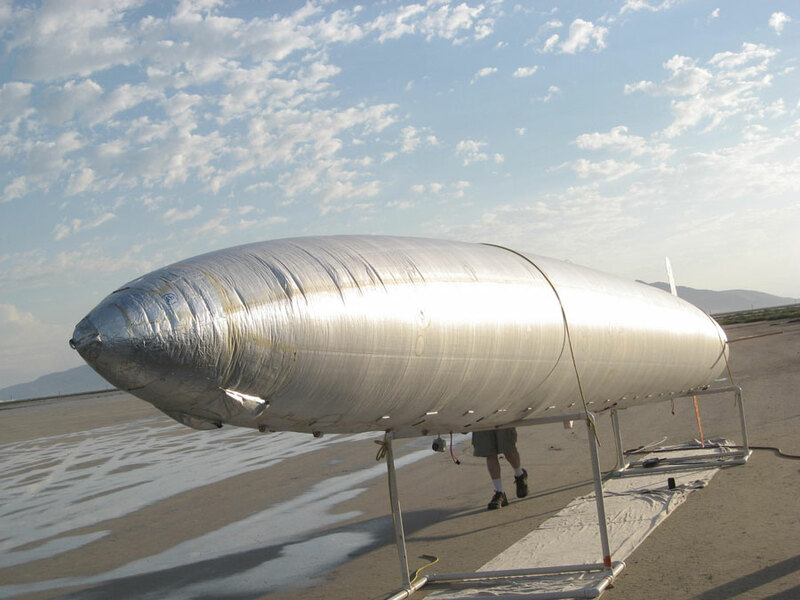 Hyperblimp intends to re-inspire the use of airships for inter-continental cargo and ultimately passenger travel, literally paving the way for the future of energy-free flight, replacing aviation as we presently know it. Hyperblimps can be used for aerial photography (still or video), offering smooth and unlikely views that no other aircraft can get (think Hollywood, outdoor events, real estate, search and rescue, education, live news, surveying remote locations, whale monitoring, or traffic control, for a few examples). 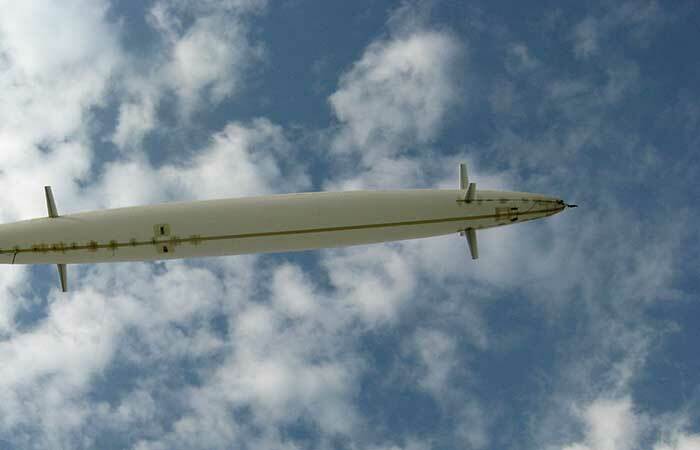 Hyperblimps can carry instruments for different purposes, such as infrared cameras (think forest fires, heat studies) or sonar equipment that can “see through clouds” and detect objects akin to needles in haystacks. And of course, there is advertising, with the mesmerizing aerobatics and relatively low cost of a Hyperblimp. These vehicles can fly magnetometers to detect metals, landmines, or various unexploded ordinances. They can carry instruments to detect water deep underground, find wooly mammoths under the ice, or meteorites in remote areas; gravitometers to measure land mass or other objects; instruments for hyperspectral imaging, that can find fissile materials or tell what minerals reside in plants or a particular soil, among countless other tasks. They can detect gas leaks or study glaciers, measure snowfall or monitor croplands, survey power or pipe lines, to cite a few examples. 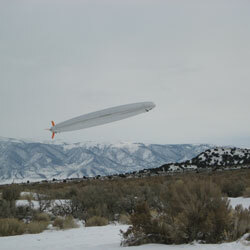 Hyperblimps can quietly watch wildlife or float into wilderness areas that are otherwise inaccessible. With development, they can identify and selectively spray invasive weeds, or help with pine beetle studies and eradication. 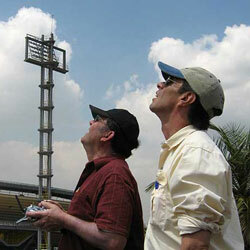 They can spot poachers or monitor crime scenes. They can help ranchers keep track of livestock. They can work as communication vehicles, offering broadband or other services where such does not now exist. 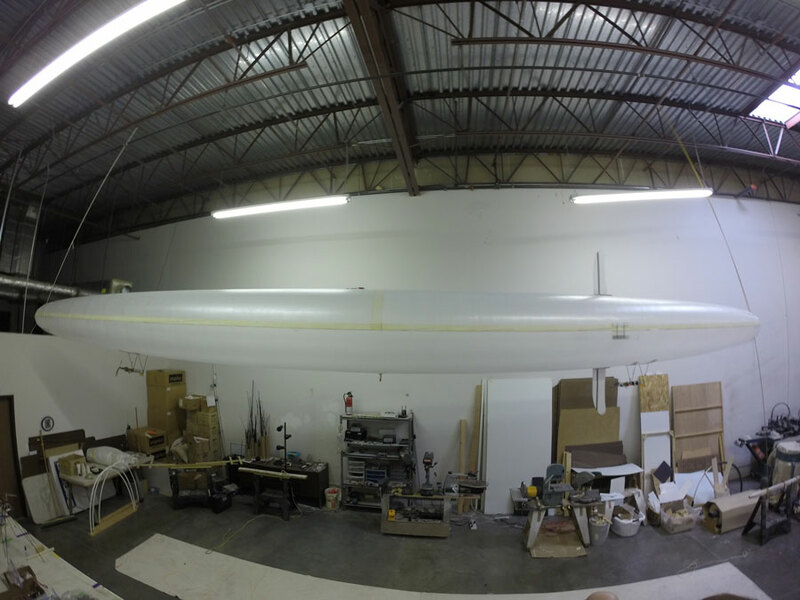 Thinking larger, Hyperblimps could carry small payloads over small distances, conceivably within cities (assuming FAA approval); FedEx could conceivably expand and improve their services. Hyperblimps can promptly deliver medicines and water in disaster situations, not to mention providing instant disaster monitoring. 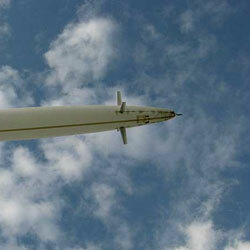 They will eventually be able to deliver large payloads over large distances, with no airports or pilots necessary. With sufficient research and development, they can carry passengers for environmental tours, and ultimately, haul passengers across oceans or around the world, as they did extensively in the 20’s and 30’s. They will solve fossil fuel problems for transportation, given that they can already run on sunshine, with off-the-shelf materials. They may well replace costly and often dysfunctional satellites, for many studies now carried out by satellites—but at closer range, for yet better viewing. They can conceivably help us study planets with atmospheres–as NASA is already actively working on for traditional blimps-except Hyperblimps will be able to do so more effectively than traditional blimps, as a result of their unique capabilities. Think of the Mars Rover covering hundreds of miles a day, rather than feet or yards. 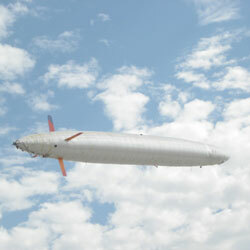 What are some advantages of the Hyperblimp? Hyperblimps use no energy to hold themselves up. Imagine the difference between adding energy to keep a rock suspended in the air, versus filling a balloon with helium and allowing it to float in the air by itself. Watch fish in an aquarium and you can readily grasp the similarities with LTA vehicles. 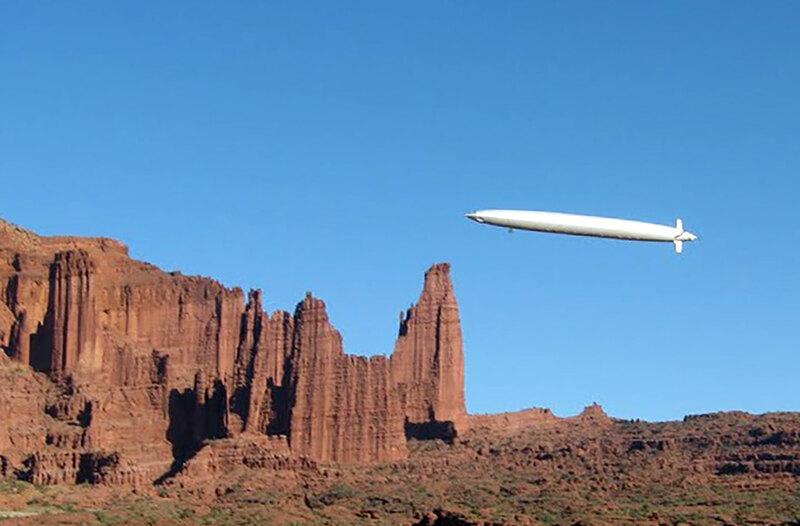 By going to remote control, huge amounts of weight, along with lifting gas and drag–are eliminated, yet many of the usual goals of flight can be met, such as carrying various payloads or using transmitting camera for “a bird’s-eye view.” Lightweight, powerful motors, lithium polymer batteries, paper-thin solar panels and stronger materials with better helium retention allow for airships to be built with a small fraction of the weight formerly required. 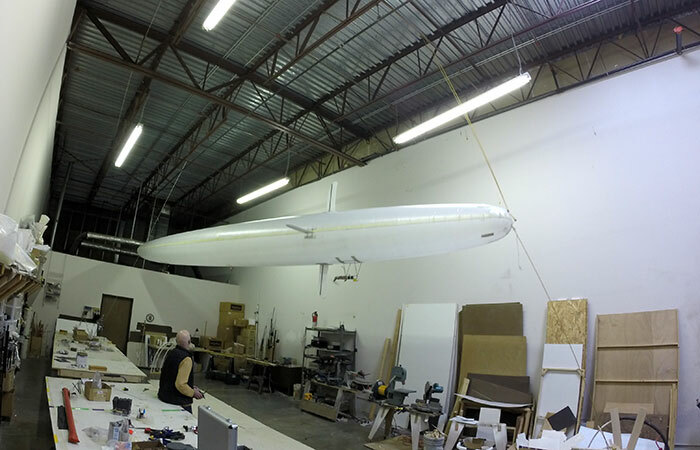 These changes allow the Hyperblimp to slash energy input to a bare minimum. How is this airship any different from blimps, dirigibles, Zeppelins, and so on? 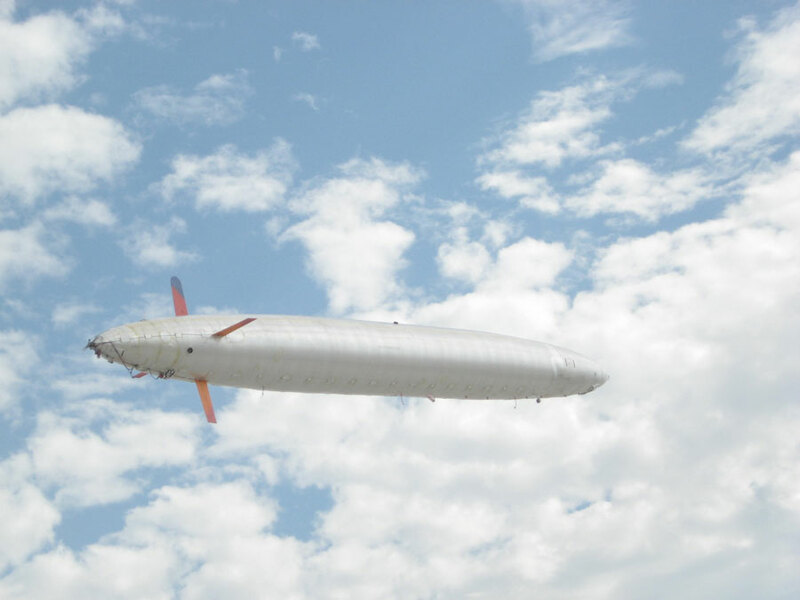 The Hyperblimp design is highly streamlined to reduce “form drag,” going from a bulbous shape to a streamlined “cigar” shape. 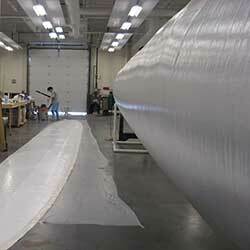 Since the shape is maintained by internal gas pressure, there is no added weight from an internal frame. This allows for impressive speeds and maneuvering, as you may note in our video gallery. 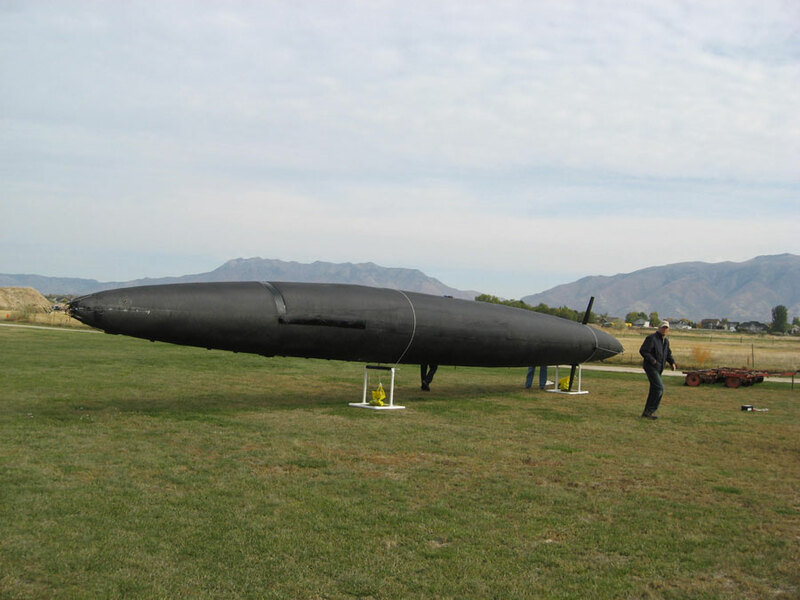 Can you give a brief history of the Hyperblimp? Geery’s adventures with airships began in 1995, after reading The Deltoid Pumpkin Seed, by John McPhee. This book covers the exploits of The Aereon Corporation, founded in the late 1960’s, by the late visionary, Monroe Drew. McPhee explains how the idea for Monroe Drew’s company came from an inventor who lived in the 1800s, and though unsung and forgotten, was flying a steerable dirigible in the 1860s, long before the Wright Brothers took to the air! 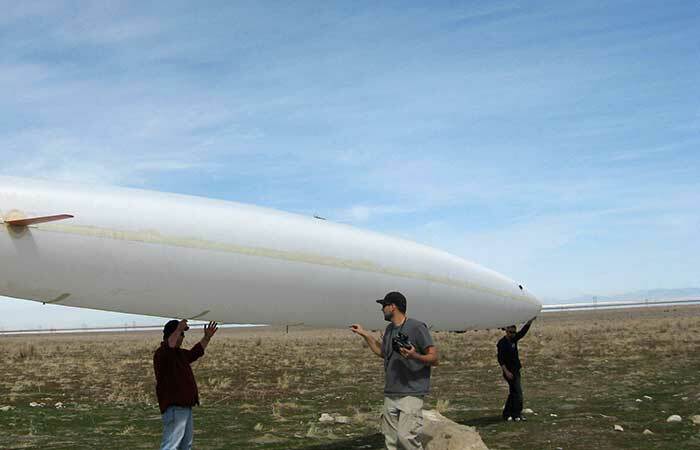 Given new materials and power sources, along with engineering considerations, Geery shifted from gliding airships to the Hyperblimp design and using solar-power, lithium batteries, and eventually fuel cells, since it became apparent that the dream of low cost, clean, renewable air travel is doable with off-the-shelf materials. Why are they so large? Once in the air, Hyperblimps (even our 50er) doesn’t look that large. 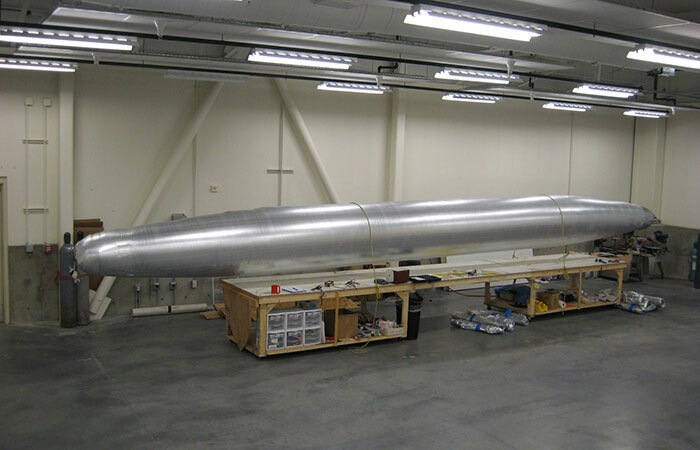 However, the main consideration regarding size is that it takes about 15 cubic feet of helium to lift one pound (this will vary with altitude and temperature, lower numbers creating more lift). 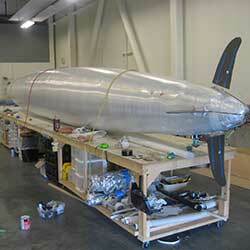 You need to subtract out the weight of the envelope, motor, batteries, fins, etc. 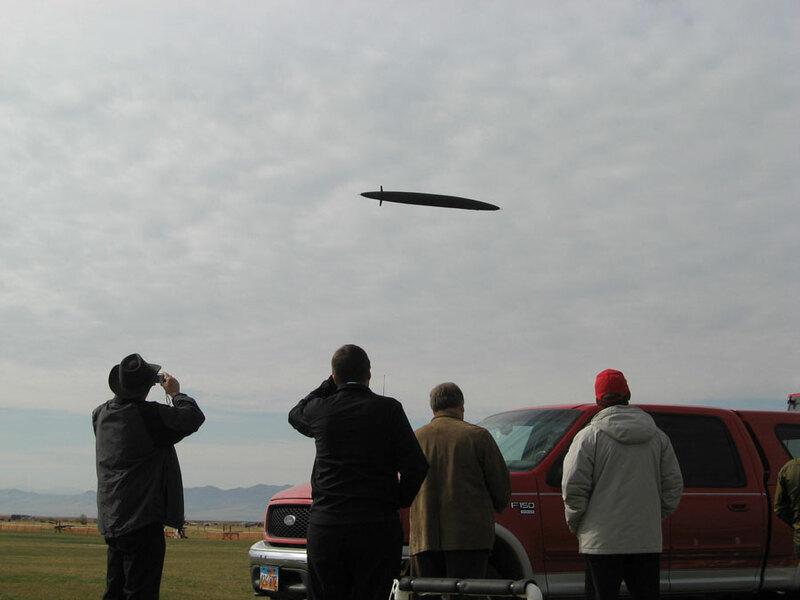 to see what the “free lift” or “payload” will be. This is why we encourage potential buyers to “think small” in terms of payload. 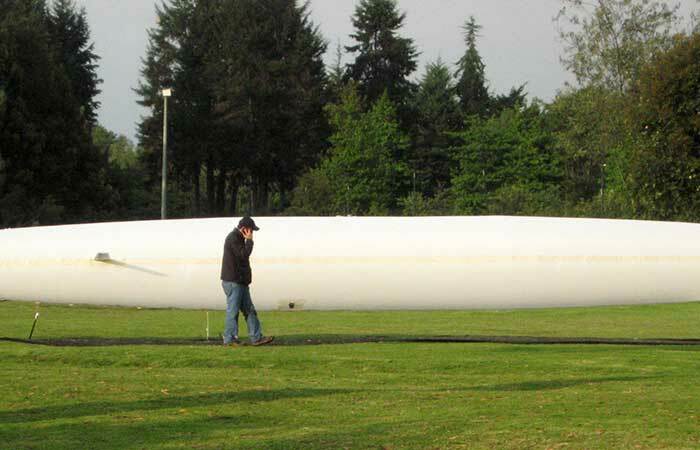 Every ounce saved there translates to more battery power or smaller ship and less helium usage. Like most things, the more one uses the Hyperblimp, the fewer drawbacks there are. The main one we perceive is the initial set-up and balancing, but this can be done in 15 to 20 minutes with a little practice. 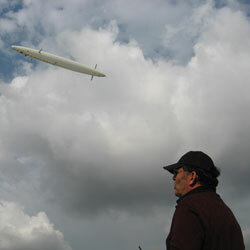 A major advantage of the Hyperblimp is that is extremely easy to learn to fly, particularly on a calm day. Get it balanced in front of you, and there it sits, floating like a toy balloon. Open the throttle slightly and fly in low speeds to “get the hang of it.” In short order, you’ll be astounded at what these machines can do. How do these airships handle in winds? 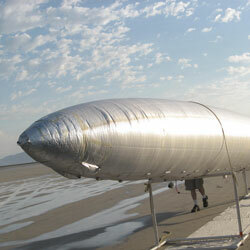 Hyperblimps, like traditional planes, can handle winds according to the speed of the ship. 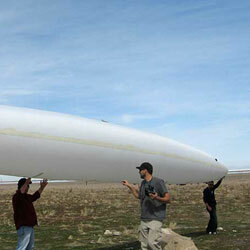 Our top speed as of July 10, 2010, is 40 mph, enabling a skilled operator to fly in winds of about 15 mph. We hope to be surpassing that speed soon. As for crosswinds, the ship is simply “crabbed,” just as a traditional plane is. Can other lifting gasses be used? Are they any other inventions related to the Hyperblimp? Christine Geery stumbled upon her husband on an on-line dating site, in one of the happier on-line endings we’re aware of. Fleeing from Hamilton, Canada, Christine lived in California, and Arizona, before moving to Salt Lake. Her book, Heart Full of Hope, has won much praise and countless wonderful comments. Christine taught elementary school, helped manage her deceased husband’s businesses, including a fifteen bay garage, and managed dental offices. 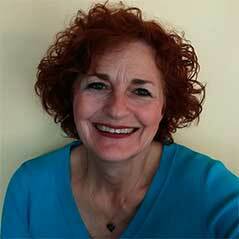 She is an avid reader, lover of dogs, gardener, gourmet cook, and loves nature. 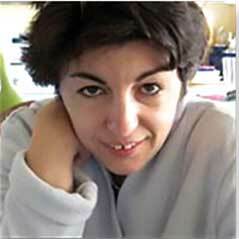 Her Sicilian background makes her the ideal person for CEO of Hyperblimp! EDUCATION: B.S. Biology, Adelphi University, N.Y., 1971. M.S., Education/ Reading, Long Island University, N.Y. 1973. 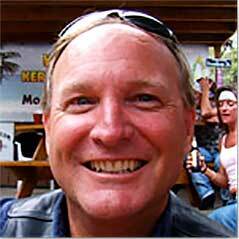 BACKGROUND: Daniel Geery has worked with alternate energy issues for several decades. 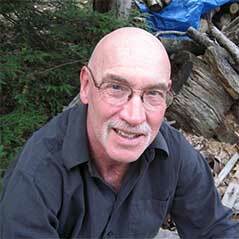 He designed and developed an earth-sheltered solar greenhouse and wrote a book on it, built an earth-sheltered solar-powered home and lived off the grid for 15 years. 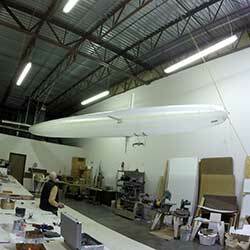 He has a patented design for ultra-efficient airships and built over 500 working models. 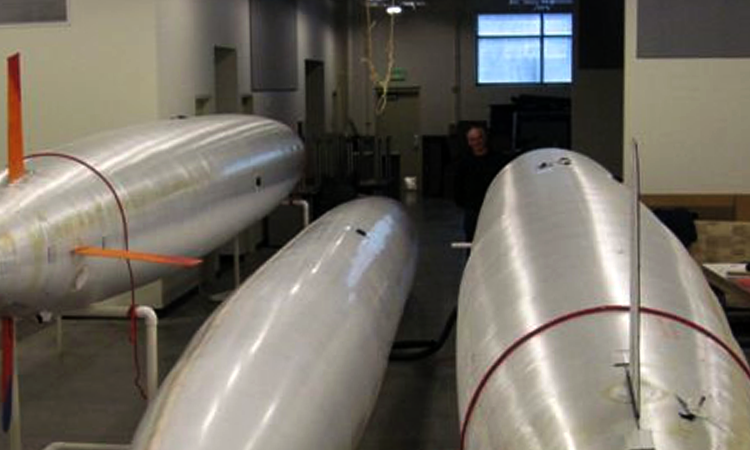 He has a patented design for underwater gliding vehicles, presently being sold as a water toy worldwide (see www.aquaglider.us; this design involved making over 5,000 working models, and was the first known translation of Archimedes’ principles into lateral upward gliding motion. Gerry has been a science teacher in public education for twenty years, and recently taught flying and Mars exploration classes at the Utah University Museum of Natural History. John Lockwood grew up on a farm in Michigan, where he and his creative brother had to design and make anything they wanted to play with. 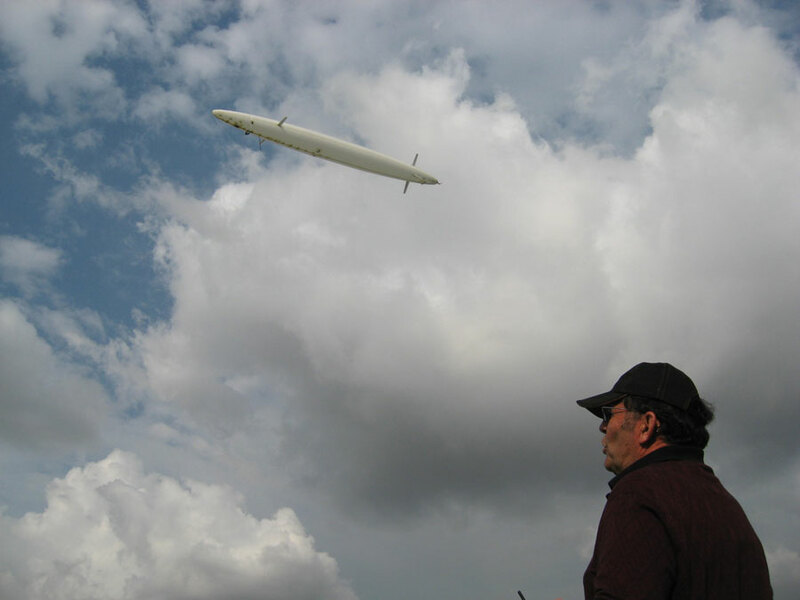 With over 40 years of RC flying, John has “made the rounds,” and can tell you the details of just about anything from during that time--motors, wingspans, motors, props, even screws used!--, along with anything about any plane you might see overhead. 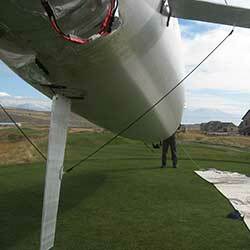 He learned to fly a 50’ Hyperblimp and a 4” quadracopter in the same amount of time—about five minutes! In the armed services, his career was instructor in battle damage repair, where anything broken had to be fixed, quickly, efficiently, and well, generally with limited or “homemade” parts. All of which helped make him the mechanical genius he is, and an ideal colleague for Tesla, Edison, or the Wright Brothers, if they were still around. 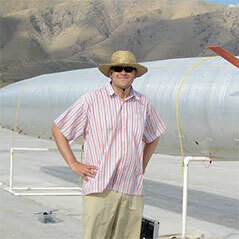 Peter Clay spent twenty plus years developing advanced technology projects. 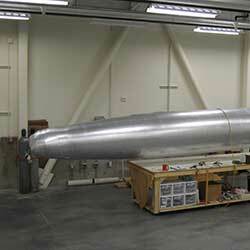 As Technical Director for Sanswire Airship, he was responsible for R&D involving lightweight gas management systems, nanocomposite materials, and advanced propulsion systems. 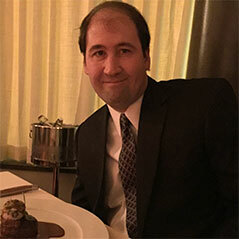 He has been actively involved with technology sourcing and presently serves as a Senior Process Developer at a major cable company, providing expertise on an alternative energy team. In his “spare time,” he works with a consortium of technologists to develop large scale solar photovoltaic manufacturing and electric vehicle projects. His personal home/office is designed to create net zero pollution and cost, using solar electric and hot water systems with upgrades paid for primarily by tax incentives. After securing three rides on the Goodyear blimp at age 19 and reading every LTA book in the Los Angeles Public Library, Don is a self proclaimed “Blimp Geek”. 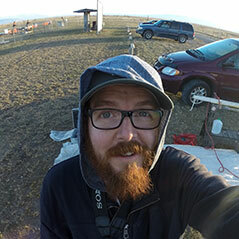 His 20 years of blimp experience are born of in-field work and experimental applications, including mixing steerable kites with helium balloons. 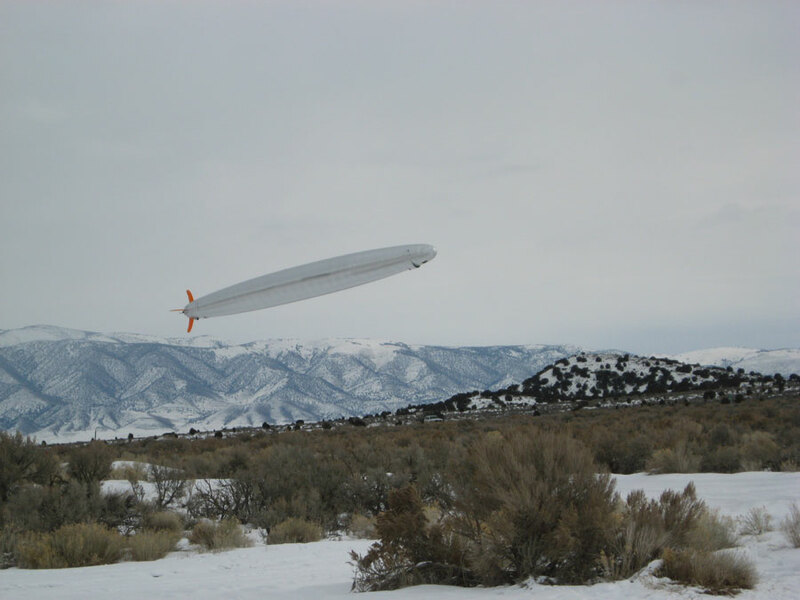 Don has flown tethered blimps for a national restaurant chain for three years, even in snow storms of Colorado’s high altitude atmosphere. He has also flown for radio stations and car washes, in addition to RC blimps for the Rolling Stones and B-52 rock bands, college and professional basketball teams, including the Denver Nuggets, La Crosse teams, pro and semi-pro hockey teams, and Colorado Avalanche for four years. Don is a 21st Century “barn-stormer” who likens blimp flying to airborne white-water raft trips; he sees the sky as an ocean touching all doors and humans worldwide. Michael Colton earned his degree in psychology before realizing he was an electronic engineer—self-trained and presently designing sophisticated circuitry for a prototyping/ development company. His passion for flying quadracopters led him to making them with his own ever-evolving 3D printer, while he pushes limits in all areas. 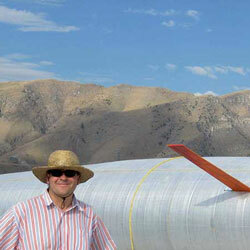 His website, www.utahaerials.com hosts some outstanding videos and info worth spending some time on. If there is anything electronic that Michael can’t figure out, we have yet to see it! His circular-polarized transmission promises live HD video on the order of 25 miles with no interference. He flys his quads by view and can tell you what they’re doing long after they’re out of sight, then bring them back and land them at your feet. Harvard grad and creator of cellbots.com, Patrick has been exploring the use of smart phones as low-cost, high-capability robotics control systems. He has built supercomputers for NASA and designed network appliances for small businesses. 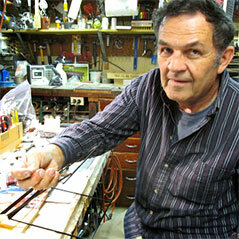 He became fascinated with PID control loops while assistant-teaching a course in circuit design. When not working on airships, Patrick also manages a small certified-organic farm, in addition to a medium-size computer business for maintenance and data storage. Erin graduated high school in Scottsdale, Arizona. She has worked many jobs, both in the food industry and organizing city records. She has done much volunteering with underprivileged children, and assisted with flight and Mars classes taught by Geery. Erin specializes in laying out and gluing airship envelopes, organizing and cleaning shop, labeling countless items, and making, acquiring, and organizing shelves. She helps set up airships for flight and repacking, monitoring wind conditions, and getting the right stations on Pandora. Has 12 plus years in art and design, world traveler, and passionate about his work. More soon to come. 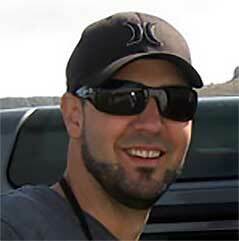 Spencer graduated with a Bachelor of Science in Entrepreneurship from the University of Utah in April 2008. He has over 12 years experience in sales and technology-related products. At Utility Trailer Sales of Utah, he has been involved in new and used equipment sales as well as managing parts accounts for a myriad of truck and trailer shops. As a traveling salesperson for Avalon, Inc. he presented complex software to business owners and performed onsite training for implementation. Spencer helped build, expand and manage a call center for Avalon’s subsidiary companies. This involved managing teams for customer service, tech support and phone sales. 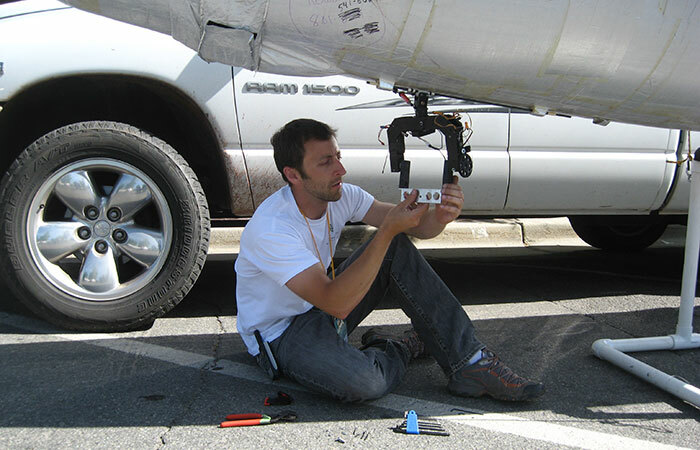 Spencer is an avid RC modeler and hands-on engineer with experience in gas and electric, fixed wing and rotary aircraft. 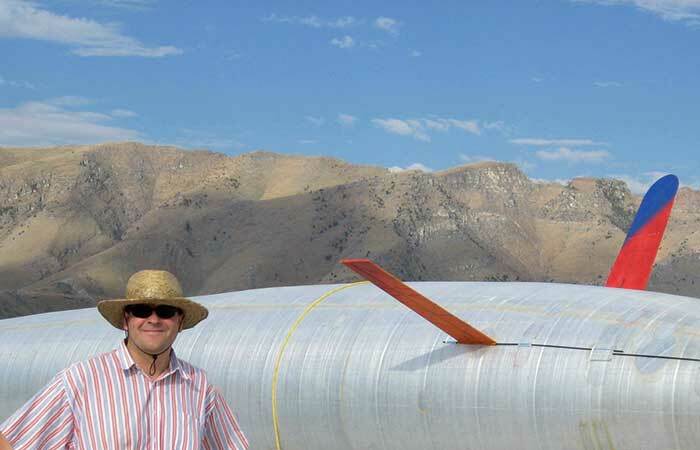 He is also a published author on advanced glider flying techniques, and has set world records in dynamic soaring. With over 15 years experience in building strong, lightweight structures, and has a solid grasp of the physics and geometries of building with advanced materials and incorporating sophisticated electronics into aviation and other RC vehicles. 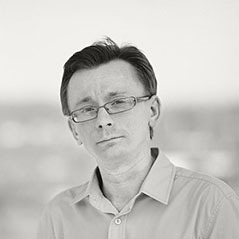 Dmitriy graduated with a Bachelor of Science in Electro-Mechanical Engineering from the National Technical University in Ukraine in June 2011. He has over 5 years experience in industry automation technologies, embedded systems development, including control systems for drone airship for 24/7 autonomous flying. He presently works as a software engineer for a global company "in his spare time." 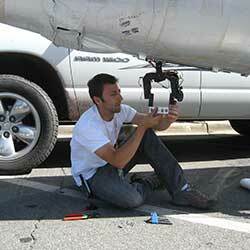 His goal is to help develop the first remote-controlled, solar airship to fly around the world. 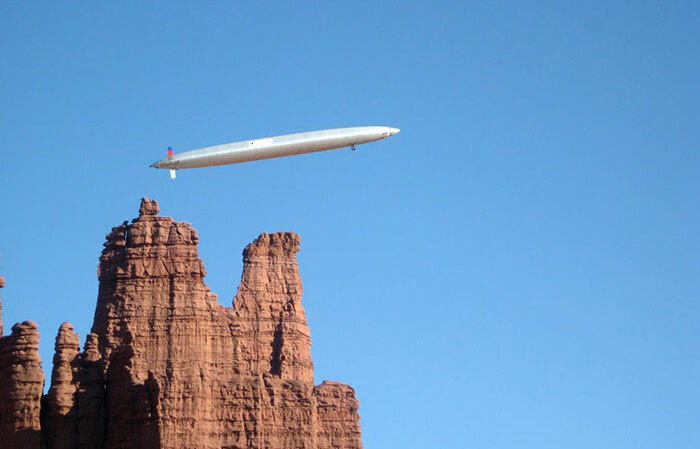 Like most words, this phrase can have a few meanings, but let’s keep it short: Hyperblimp LLC produces and develops airborne vehicles, traditionally called “lighter than air,” or “LTA.” Technically, they are “light as air” when filled with helium or “LAA”-another term might be “neutrally buoyant.” This is in contrast to “HTA,” or “heavier than air.” As explained elsewhere, Hyperblimps float rather than fly, saving the huge portion of energy used to create “dynamic lift” in traditional planes. But we like to apply the term more broadly too: Humans do better when generating light than heat, understanding and thoughtfulness rather than ignorance and hate. Plus there is that all-too-common tendency to take ourselves too seriously. Thus we encourage people to take themselves a little lighter and bit less seriously-with ourselves for starters!